Meatless meals have become a regular on our menu plan not only for the savings but because we enjoy the simplicity of a veg dish with simple alternate proteins other than meat and fish. 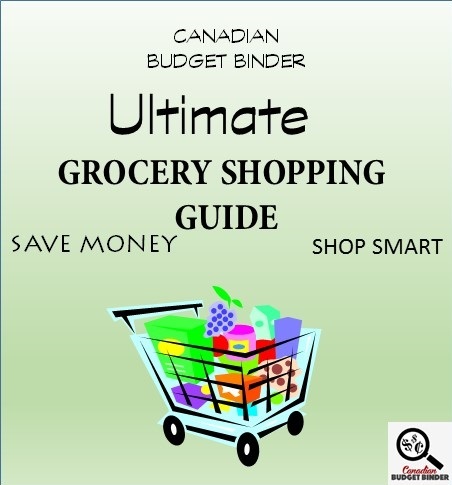 That might sound a bit awkward to someone who doesn’t use a grocery budget but for our family a budget is essential to keeping us accountable for the food that we purchase. If you aren’t already aware there is a day dedicated to meatless meals and that day is Monday. Just because it sounds good though doesn’t mean you are required to forgo meat on a Monday. After a weekend of comfort food with the family a Meatless Monday is a nice way to start the week but it’s also a nice way to end the week or slow it down in the middle. What I love about ditching the meat once or twice a week is that I can batch cook easy meatless meals and enjoy leftovers the next day. I’m not a huge fan of re-heated meat especially if it is a steak, chicken, roast beef, pork steak or any meat that will dry out once it’s cold. I’ll eat it, but I might not enjoy it like I did when it was freshly cooked. I find any type of mince meat or sausages bulks my dinner meals for work so I tend to favour those proteins. Both mince and sausage vary in price weekly depending on sales and like everything else we’ve seen an increase in meat prices over the past 2 years. The wife and I decided a couple of years back to stick to at least one meatless meal a week. We would typically eat meat of some description every day. Once we found out that we could save up to $400 or more each year by going meatless just one day a week we were hooked. Even though we eat less meat we still needed to replace the protein with nutritious eggs or pulses (Beans). We became hooked on beans so much that we were buying bags of dry chickpeas, kidney beans, black beans and lentils to also help save grocery money. If you’ve never had a vegetarian black bean burger put it on your recipe list. It’s flavourful, filling and you don’t miss the meat. Buying dry beans and rehydrating them yourself may save money but if you want the convenience factor canned beans are just as delicious. You’ll pay more but you get the instant gratification of beans on demand. Other ways we save money on meatless meals is to buy in season, shop local markets during the growing season or grow your own vegetables. Take the opportunity to visit at the end of the market day to find reduced produce when farmers want to get rid of their pickings. Ditch the sugar and go for natural alternatives such as fresh honey from a local market or honey producer. I’m still a sugar guy with my coffee and when I bake but that’s about it these days unless it’s specific for a recipe. You’ll pay a fraction of what you will pay in-store for market honey and you know it will be the good stuff. Growing herbs is another great way to save money because herbs can be pricey to buy at the grocery store but they add so much flavour to a meal. We’ve made basil pesto just about every year from herbs we’ve grown in the garden. Sometimes herbs grow in such an abundance don’t be shy to mix in different greens when you make a pesto. One of our favourites is chives, spring onion, garlic, parsley, basil and almond, walnuts or pine nuts. Our meatless dinner ideas took some collaboration with the wife which meant that we would experiment to find out what we enjoyed. 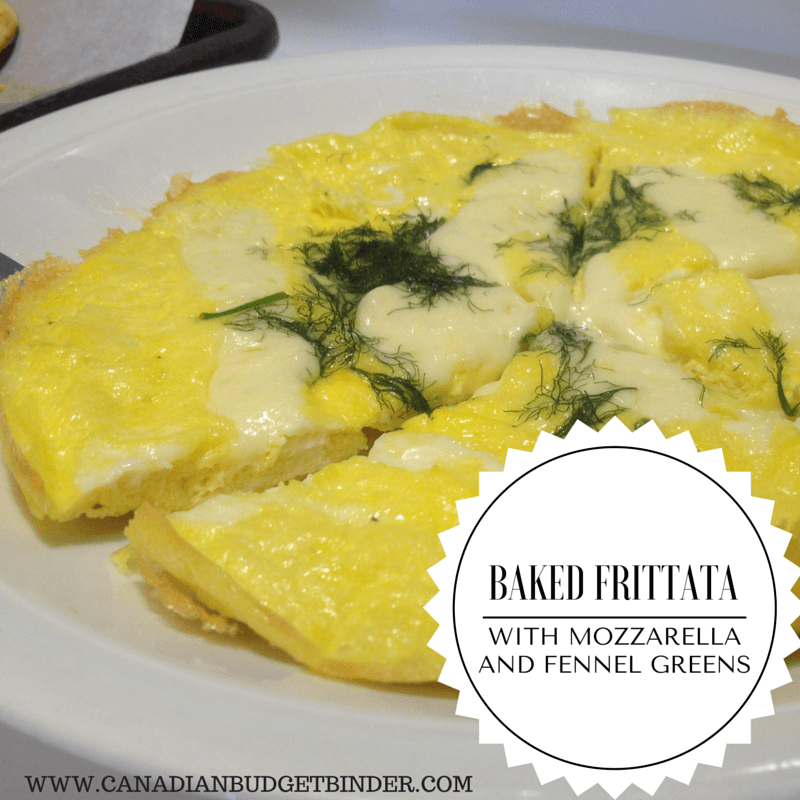 Over the years we’ve managed to grow our free recipe index on Canadian Budget Binder with some of the best recipes to come out of our kitchen. There have been many lazy kitchen days where we stick to simple salads or even take to Pinterest because there are so many inspirations to get the creative cooking juices flowing. Today I want to showcase meatless meals from CBB and other amazing Food Bloggers from my Pinterest feed that are affordable and easy meatless meals for just about any income-level. You don’t have to go broke to eat well!! 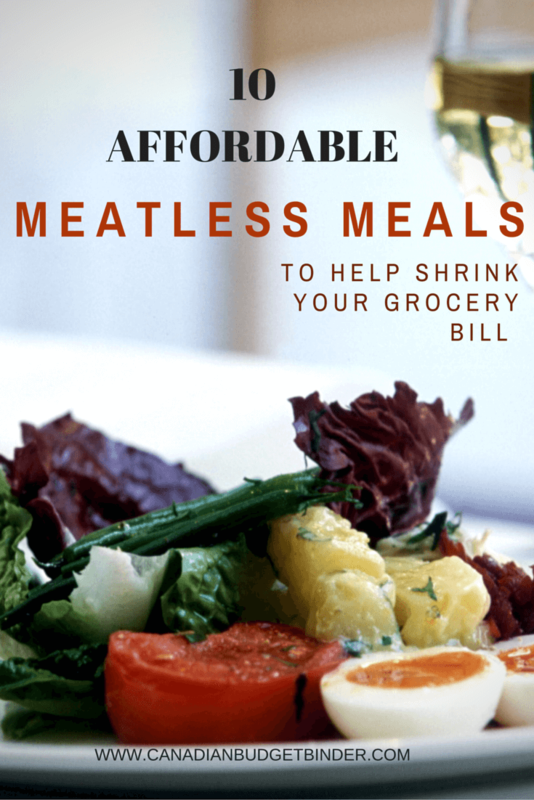 A few of my awesome fans wanted to share their Meatless Meals with all of you so they wrote in to tell you just how important going meatless is for their grocery budget. Donna P– Beans & fried potatoes can’t be beat! I also prefer fried okra instead of meat which I dice in coins and roll in seasoned cornmeal. Fry until brown and crispy.Veggie burgers are my favorite. Christine W– Potato cheese omelette and homemade mac and cheese with peas are the go to here. Cheese is a great thing to add to any meat free meal here or one with meat. My boys love cheese!! Here is a recent meatless omelette that we made in the CBB house! Colleen K. – Chickenless Chicken Mushroom Fettuccine is a favorite here. Dice a small onion and saute in olive oil, add 3 heaping tablespoons of chicken soup base, 1 can of mushrooms in juice, 1 can of cream of mushroom soup, 1/2 soup can of milk, heat thoroughly, add a couple good dollops of sour cream and stir in. Serve over cooked Fettuccine noodles. We make this to help save on the meat bill….a tasty dish that is cheap to make. Beth Anne – I go meatless at least 3 days each week, usually more, because it’s the only way I can stay within my food budget. 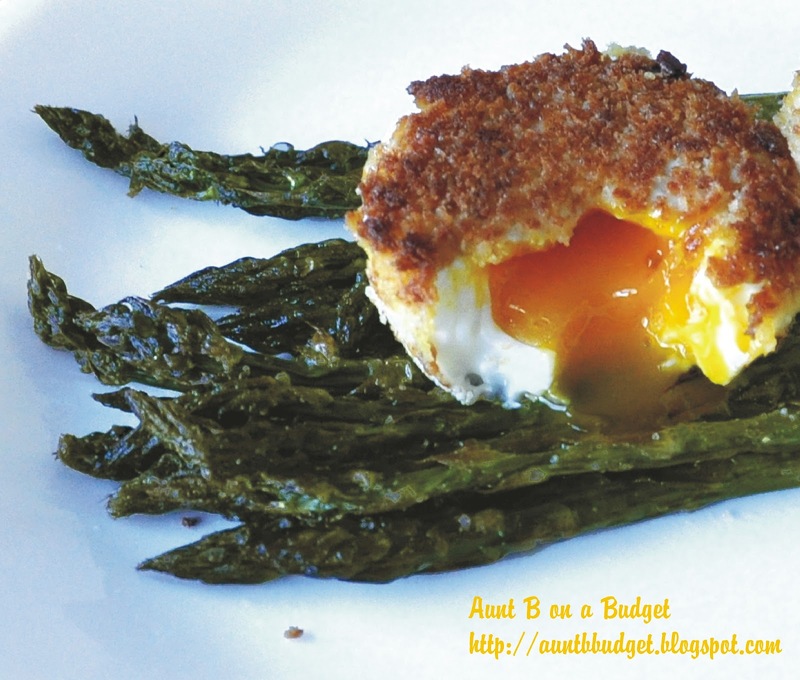 Roasted Asparagus is one of many meatless meals on my blog. Challenge yourself in the kitchen and try something new because sticking with the same recipes week after week gets boring. Awaken your taste-buds and bring lots of new flavours to your plate. 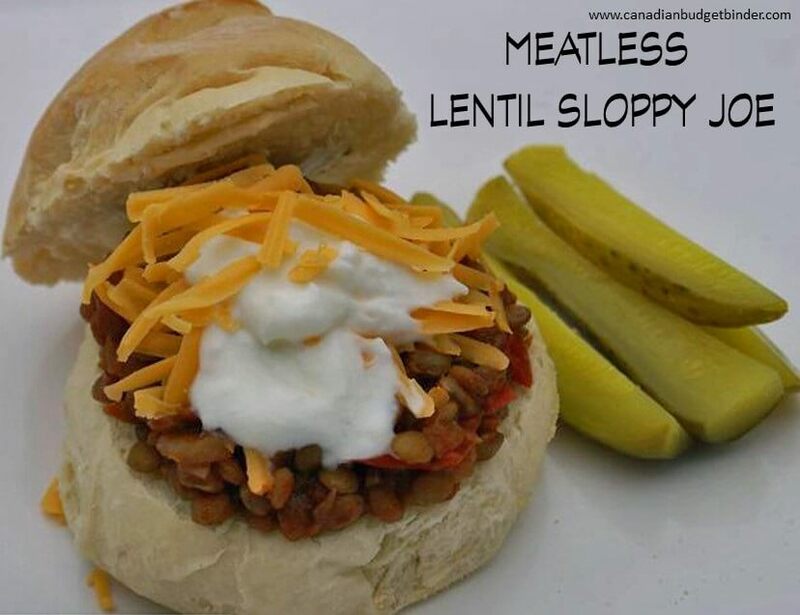 Meatless Lentil Sloppy Joes are a wonderful alternative to the original beef Sloppy Joe. I used green lentils which are heartier and stand up to the mush test. If you love to bake make your own baps and fill them with your lentils topped with whatever you fancy. Even our son loves this recipe. Honey Garlic Baked Cauliflower is to die for. If you haven’t tried this yet it’s a must to add to your meatless meals recipe box. The sweetness from the honey paired with the smokey baked taste of the cauliflower make this the perfect pair. These Vegetarian Zucchini Meatballs spell comfort food that you must try. We make a similar recipe at home but with eggplant and beef to help cut the amount of beef we use. Making meatballs is a labour of love but when you take that first bite you’ll be happy you did it. 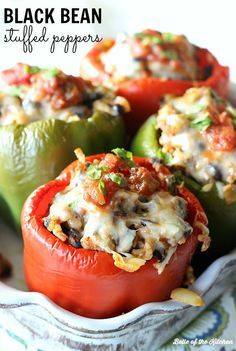 I’ve never tried this recipe but the minute I saw it I knew it was something we would try in our house since we love black beans. They are so versatile that you can squish them to create patties or stuff them into just about anything. I’ll be trying a variation of this recipe for the wife and I’ll let you know what they turned out like. This photo is drool-worthy for any foodie. 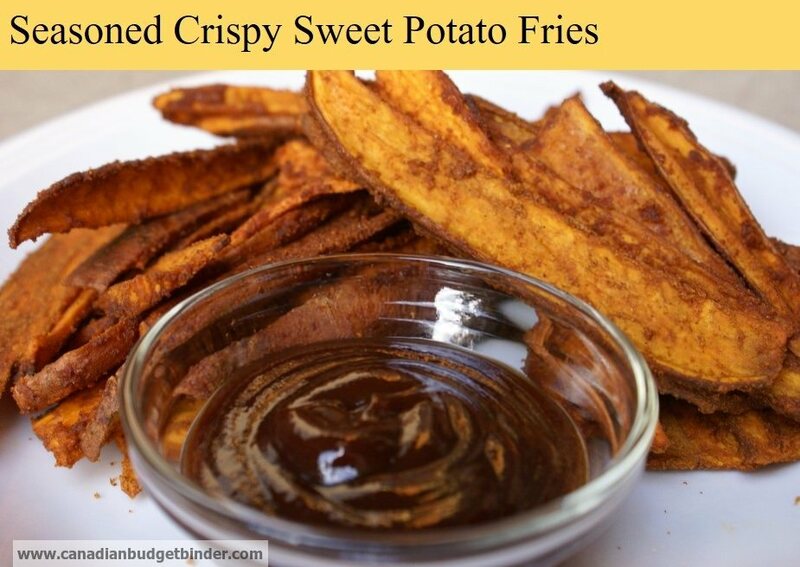 This is a popular recipe on our blog and one that took me ages to perfect as it’s not easy to crisp up sweet potatoes in the oven without burning them to death. We don’t eat these often enough since they take some time to bake however when we do it’s a real treat. I’m almost certain our son will love them. 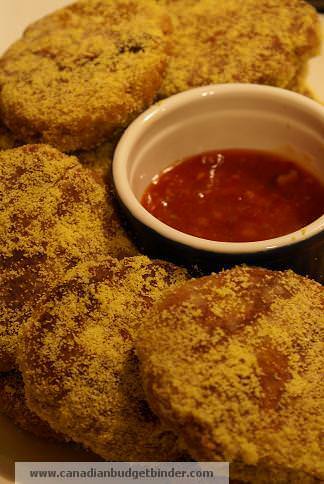 This is a simple fish cake that can be made when you are in a pinch for time. You can buy a bottle of pre-made sweet Thai dipping sauce in the International aisle at your grocer. 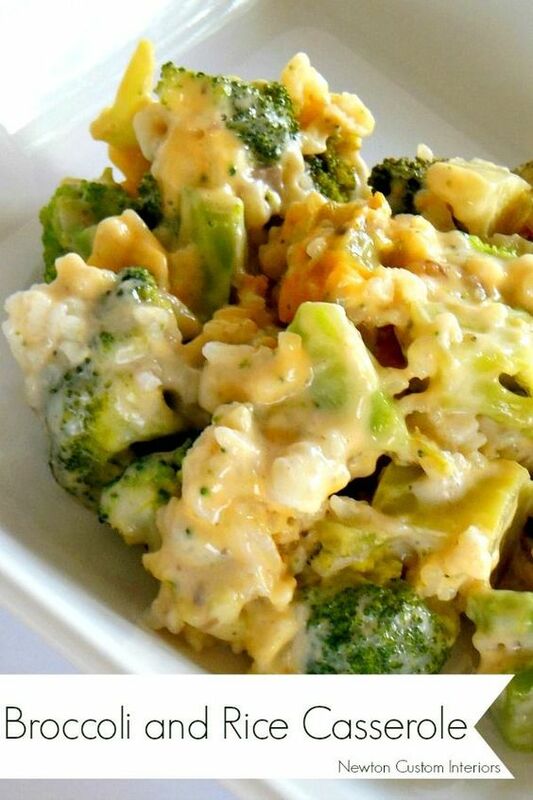 I love my rice and broccoli is one of my favourite vegetables so this recipe was a must for me to share with you today. It would be perfect as a main meal or as a side-dish for dinner and takes hardly any time at all to make. If you don’t fancy white rice you could substitute wild rice or brown rice instead. I’ve made homemade gnocchi in the past and they are delicious, inexpensive and easy to make. Once they are in a pot of hot boiling water they take minutes to float to the top. The sauce is what will make or break your gnocchi as they are little potato dumplings without much flavour at all. Mushroom Marsala…that says it all. Can’t wait to try this recipe! The fans of the What’s For Dinner thread on Facebook were just chatting about tortellini the other day. Many people enjoy tortellini as a pasta dish however you can add it to your favourite broth to create a lovely soup. I’ve never made a creamy tomato based soup for tortellini but I have incorporated them into many other soups. You can buy tortellini in 1lb bags for roughly $1.99 in the freezer section at your grocer. These days the wife is enjoying opposite of the vegetarian menu since she has been on a low-carb high fat diet also known as the Atkins Diet since November 2015. This means she consumes more meat and small portions of mostly green vegetables which has made it a bit more challenging to stick to our grocery budget. It’s possible but takes work which we have been committed to doing. . If you want to be a Deal Sniffer the best way to start your journey is to create your budget, meal plan and start deal hunting. 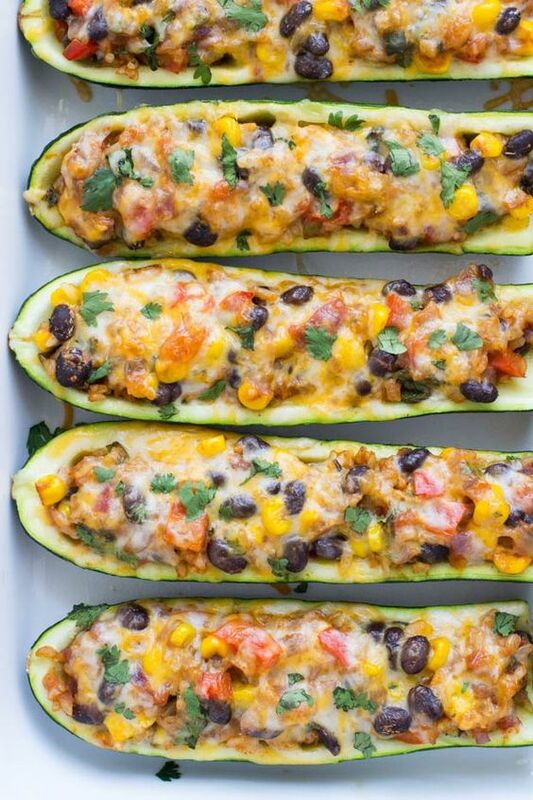 What are some of your favourite meatless meals? April GGC Winner! Congratulations to Ballot #28 Christine W. Please email me your address. This is a new month which means this is the first post for May. It was a small grocery shop to start the month but we have enough food around the house that we need to get through. Our son has been hardly eating anything so we’ve struggled to find foods he will eat. Most days he wants to drink his milk and have a few bites of something here and there. He’s the type of kid who only eats when he’s hungry. He doesn’t want to be put in front of a meal and be told to eat. He won’t eat it. He once loved cheese and grapes and now he won’t eat it. He used to eat cereal and oatmeal but wants nothing to do with it now. We’ll keep trying. A couple of you pointed out that prices were on the way down for some grocery store items such as bananas and other produce. The time of year is coming where should expect to see a fall in prices given the vast amount of produce rolling through the stores and markets. How do I send you a pix? I took a picture of this weeks “box”. 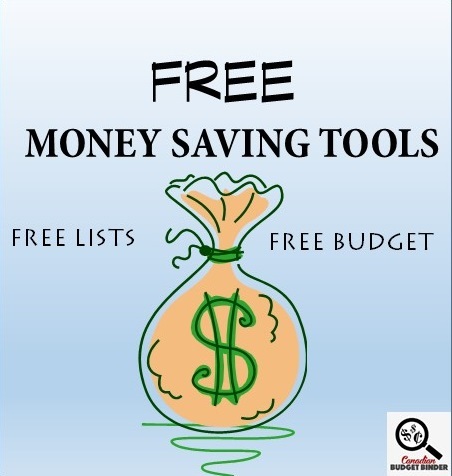 You can email me canadianbudgetbinder @yahoo.ca without the space. I do that to keep spam away on the blog as they attack email addresses. Rhubarb apple crisp is my all time favorite! Our family tried the honey garlic baked cauliflower that is part of this post. Excellent. My coloration was much darker, but I may have put in extra soya sauce as I eyeballed the ingredients. Excellent dish, we will make it again! A good start to the month! The coffee was a nice find, $1.99 each regular $7.99. It’s close to it’s date but it won’t last all that long here. Once the can is open I keep it in the fridge. The Royale product was a good deal and having the coupons made it even better!! Given that hubby is prone to the runs due to meds and such having nice soft TP is a good thing!! Lol!! The Air Miles discounts were handy as well. Every little bit that will help my budget is good in my books!!! With this being a5 week month I need to be careful. I get mailings of coupons from our own Juanita!!! The butter was an Air Miles discount and only good for one pound, but I can handle that!! These are offers they send me to load much like we do with the Shoppers Optimum or PC plus offers. I have seen offers in the Sobeys flyer so you might get lucky yet. This was a big week for us, but we managed to spend as little as possible. Thanks to the Neilsen Homescan visa $15 cards, we were able to get a few “fun” things at Walmart (aka junk food) along with yogurt, garbage bags, dish soap, windex. I tried the great value version of windex the last time I bought window cleaner and it was awful. I will buy the better stuff whenever I can. I may try the greenworks version at some point because I do like that brand, but not now, I really want to use up what I have left of the great value stuff and then get to some really clean mirrors and windows. We needed a lot of fruit and veggies this time. Our fridge was practically empty, it was sad. The volume of PM items helped bring our out of pocket amount way down compared to what it could have been. It’s a good start for the month, a little over the $50 target weekly, but with 5 weeks and at some point we will be able to cut it down again, this is completely reasonable. Next week we will need protein, so that could get costly. I will work on being creative getting the most for as little money as possible. We shall see! We are planning to start making refried beans at home. Our son is a bit difficult about black bean for some reason rather than pinto bean, so I am thinking we need to get some to rehydrate. We have been slowly moving to the dried beans to rehydrate. I love the Neilsen Homescan and the random visa cards that have been showing up in the mail. Hubby wasn’t keen on it at first, he has changed his tune now! Weekly Overview : I missed last weeks grocery post, things were just too….. hectic. But I did add the shop into the relevant totals. I came in $2.13 under for the month, so I just made it. I guess that is a good indication that $450 per month is the right total for us at this time. We did have a splurge or two for the last shop of the month it was my hubby’s BD and he requested barbequed ribs and carrot cake. Not exactly budget food LOL. This grocery shop I had some good Air mile offers so I took advantage of those, pineapple, frozen peas, and yogurt. I do not buy ground beef very often but I had a real craving for tacos…. So tacos it was! I am looking forward to this weekend. My first CSA box will be ready. It is a spring box so will be full of organic, spinach, lettuce, greens radishes, maybe rhubarb and who knows what special goodies!!!! I cut up and freeze rhubarb, then, in autumn, when apples are plentiful and cheaper, i make “Yankee chutney” which my family love. Glad to share the recipe if you are interested. That would be lovely!! We have a freezer full that needs using up and more on the way. I’ll probably just offer it up for free this summer. I’d love to have your chutney recipe Mary! I go one step further and try and have a meatless meal every other day. I would like to have meatless meals even more frequently. I will try to increase them over the summer when my CSA (community shared agriculture is in full force) and I have more time (I am a teacher). I feel meatless meals are a win, win, win scenario. It is better for you, the environment and your budget! But I find some of my favorite meatless meals take more time to cook, which is my limiting factor. Time. My super quick cheap meatless meals go tos are: Breakfast for dinner (french toast, dutch pancakes, crepes), vegetarian pasta, tofu stir fry’s, vegetable cream soups with pizza bagels or buns, homemade mac and cheese ( full of vegetables). These recipes look mighty good!! I’ll be having a closer look on the laptop tonight so I can save/print off a few. I’ll have to see how many I can get the males around here to try. Might be handy to share with my daughter as the grandson isn’t eating meat these days. Cows are cute and he doesn’t want to eat the cute critters…..
For your little fellow have you tried having a tray of cut up veggies, fruit and/or cheeses that he can pick and choose from for something to eat when he wants to eat?? If that is handy for him he just might eat more than you think he is eating…. Worth a try at least. OUR CURRENT TOTAL UNUSED RESERVES ARE $1,006.16. This means the $936.51 that we carried forward from 2015 PLUS AN ADDITIONAL $426.57 that we have added in 2016, LESS $356.92 that we have drawn out for use in 2016. The Taco Beef Bowl is basically everything I would put in a beef taco except no taco shell…just served in a bowl. I use cooked onions, cooked coleslaw, de-seeded and cooked tomatoes, several hits of hot sauce, the beef and beans are cooked with taco seasoning, then toss it all together and sprinkle Tex Mex Cheese over it with a small dollop of sour cream as the crowning glory. It’s got all the goodies from a taco without the extra carbs and calories from adding the shell. Thanks for the recipes! We try and go meatless once a week too. It is interesting when you take the time to figure out what you can save…$400.00 is a good chunk of change to add to your savings. For some families that savings is much higher depending on how much meat they eat every week. It all adds up, plus we don’t NEED to eat meat every day. Overview: This should only take about a swallow from a cuppa. Another small shop but then again my budget isn’t allowing large shops. I won’t buy hot dogs if they are full price, that’s ridiculous. I buy some of my vegetables at the market and if I can, I do go out near the end of the day. I typically can deals because I’m a “vendor” but most people can get deals during the last 30 minutes to 1 hour because the vendors don’t want to take their goods home.